Even before Jair Bolsonaro's rise, Latin America's militaries had been regaining power through the court system. Law No. 13.491, passed by the Brazilian Congress in October 2017, gives military courts jurisdiction over their personnel accused of human rights violations. Prior to the law’s approval, the Ministry of Defense publicly made the case that allowing civilian courts to handle such cases would hinder policing operations. 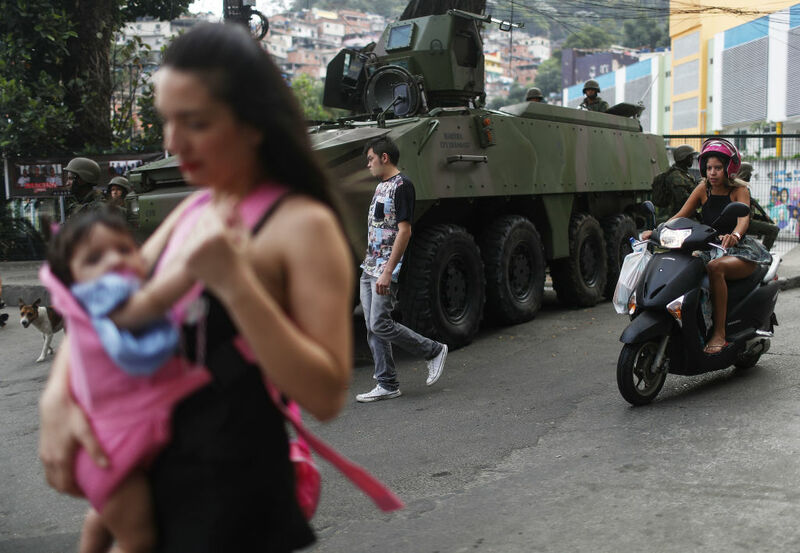 Michel Temer’s administration increasingly used the armed forces for domestic policing duties, whether in rural areas against land rights activists or in the favelas and peripheries of major cities. Elected leaders, seeking to deliver results for their voters in fighting drug trafficking and gang violence, are turning to their militaries and equipping them with increased legal powers. Military justice systems have limited use. Military personnel are subject to codes of justice for crimes like insubordination, which have no equivalent in the civilian world. But when military courts extend their jurisdiction over their personnel for crimes such as human rights abuses — and in some instances even put civilians on trial — this parallel legal system undermines the rule of law. When military courts are able to sit in judgment of the military’s own actions, they can provide special treatment to their personnel and shield them from accountability. During Guatemala’s civil war, the military created secret tribunals — termed Courts of Special Jurisdiction — to put civilians on trial, and routinely sentenced them to death by execution. In Peru, President Alberto Fujimori revived military courts as he escalated the war against the Shining Path in the 1990s. He ruled that the military had jurisdiction over any crimes vaguely defined as terrorism, and military courts regularly prosecuted civilians. Under these circumstances, democracy and the defense of human rights seem to be at odds with each other. Despite changes to the laws on the books, in many countries the military has continued to obstruct civilian investigations by tampering with evidence and intimidating witnesses. In extreme cases, members of the military have made death threats against civilian investigators, as occurred in Honduras after the 2009 coup d’état. In Guatemala, defense lawyers use a variety of delaying tactics to stall cases, such as filing numerous petitions to have a judge removed from a case or requesting their recusal. In 1999, soldiers were arrested for their involvement in the 1982 Dos Erres massacre in which over two hundred people were killed. The first convictions in the case did not occur until 2011, a full twelve years after the initial arrests. It is perhaps unsurprising that militaries across the region were reluctant to give up their legal powers. Hundreds of military members across the region have been tried for human rights violations, from low-level soldiers to former heads of state, including the now-deceased generals Augusto Pinochet in Chile and Efraín Ríos Montt in Guatemala. Amnesty laws, negotiated as part of peace agreements or passed as prerequisites for leaving power, were meant to protect militaries, but have been systematically dismantled — circumvented by creative judges (Argentina), struck down by the inter-American and constitutional courts (Peru), and revoked by politicians under pressure from human rights organizations (Uruguay). Many politicians have run on platforms promising to be “tough on crime” and have deployed the military to conduct domestic policing operations, as in Brazil, Ecuador, Mexico, Guatemala, El Salvador, and Honduras. Elected leaders, seeking to deliver results for their voters in fighting drug trafficking and gang violence, are turning to their militaries and equipping them with increased legal powers. Under these circumstances, democracy and the defense of human rights seem to be at odds with each other. Politicians are responding to public pressure, and in doing so are pursuing policies that contradict past progress in curtailing military power. The 2015 bill in Colombia to shift jurisdiction for most crimes committed by members of the military back to military courts passed with overwhelming support; only a minority of leftist politicians voted against it. The 2017 measure in Brazil similarly was approved in the senate by a large margin. To stem the tide of legal empowerment of the military and reverse these recent setbacks, human rights activists will need to be increasingly vigilant and work to supplant the security narrative that has dominated recent elections in countries such as Guatemala and Honduras, and led to the rise of populist leaders on the right. A wave of leftist politicians rose to power in the past by promising redistribution of wealth and anti-poverty plans — the policies necessary to address the underlying causes of the recent rise in crime. The recent election of Andrés Manuel López Obrador in Mexico, who ran on an “Abrazos, no balazos” (hugs, not gunfire) platform perhaps is a welcome sign. Most importantly, this will be a major test for the civilian judiciary in the region. Judicial reform has been at the forefront of domestic NGO work and international donors over the past three decades. It will largely be for naught if civilian courts cannot retain jurisdiction over the worst human rights abuses committed by the armed forces. Constitutional and supreme courts will have to rule on these laws, possibly being put in the position of having to make judgments that go against the wishes of politicians, the military, and even popular opinion. Success will also depend on the Inter-American Court continuing to be the last safeguard for democracy in the region, providing domestic courts with legal rulings to reinforce their positions. Brett J. Kyle is assistant professor of political science at the University of Nebraska-Omaha where is a member of the Office of Latino/Latin American Studies (OLLAS) and the Goldstein Center for Human Rights. He is the author of Recycling Dictators in Latin America: Legacies of Military Rule.